Home » Manufacturers » Food And Beverages Hello Guest, You are not logged in. Located in india and we are and estabilished manufacturer of soya food products which are also exported to various countries around the world. The soya food products that we manufactured are producted from high quality soyabeeans which are quality tested before its processed for the manufacture of various soy food products at our high end manufacturing unit. out high end packaging unit ensures best packaging to our soya food products which are circulated in various retail and wholesale stores.We pioneer as a soya milk manufacture in various flavored sota milk, tofu manufacturer , delicious soy biscuits and soy cookies manufacturer. 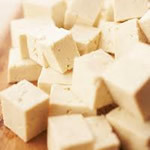 we are manufacturer of TOFU which is like Indian Paneer is an an high protien product for manufacture from soya. TOFU consiist Soy protein and isoflavones (phytoestrogens) have gained considerable attention for their potential role in improving risk factors for cardiovascular disease by reducing cholesterol levels as TOFU is cholesterol free food. TOFU manufactured by us are quality tested and packed in packets of verious weigh in terms of Gram. We have been supplying TOFU manufactured by us are shelved for retail sail in leading retail store chains all over India. We are leading manufacturer and supplier of soy milk in india. Soy milk is manufactured by soaking soybeans, grinding them with water. The fluid which results after straining is called soy milk.Every drop of our soymilk begins with natural beans grown without genetic engineering.Soy milk resemble quite like dairy milk in appearance.soy milk is protein rich and is also composes of iron, unsaturated fatty acids and niacin as compared to dairy milk. Plain soy milk is very nutritive: it's an excellent source of high quality proteins, isoflavones and B-vitamins. Soy milk is free of the milk sugar (lactose) and is a good choice for people who are lactose intolerant. Also, it is a good alternative to those who are allergic the proteins of dairy milk. Soya Milk is cholesterol free and contains important phytochemicals. Statics proove that daily Soya Milk consumption reduces the risk of prostate cancer by almost 70% and Consumption of Soya Milk lowers blood pressure in men and women. American Diamond Jewlery and Silver Art Jewelery.